Here lies Thinking Chocolate, so dubbed by this week's group of young Writopians, who after an hour or so of character hijinks and plot shenanigans, need to resuscitate their writing mojo with a snack. 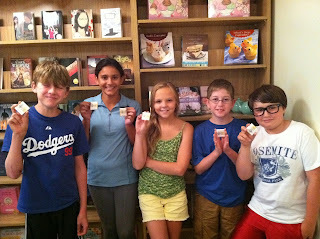 Fortunately, The Voracious Reader doubles as a tea shoppe and is happy to oblige their whimsies. It takes energy and brain power to create and brainstorm these fantasy stories. Now it has been proven that a little bit of glucose will replenish your mental capacities, and help you make better decisions. Thinking chocolate: not too small to make you want more, and not too big to make you sick. Just the perfect amount to stimulate the brain. Here they are, modeling with the chocolate: Sam, Claudia, Meagan, Johnnie and Peter. After a dose of thinking chocolate, they are able to dive back into their tales with gusto. We are only together three hours each morning, and when 1PM rolls the kids can't believe how fast the time has flown. "Can't we write all day?" With thinking chocolate, anything is possible. That article is fascinating, but after a morning working, deciding how much of the article to read, how long to read, and what to say in my comment, I have decision fatigue. 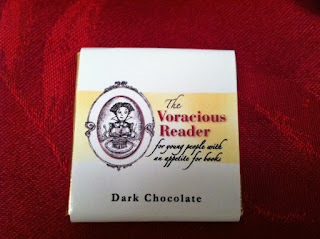 I must have thinking chocolate so I can resist distractions and finish my work. My WIP depends on it. Thank you for another reason to nibble! Typically the beauty store stations for the purpose of mane, tanning, coil nails not to mention skin treatment virtually all need to have a number of chanel replica. For everybody who is usually worried about continuing to keep the sweetness beauty store bathroom towels laundered and then a watchful eyeball at the stacks, it’s enough time to replenish. Gucci doesn’t pick up a lot of bolder as opposed to his or her's Tribeca Structure Bare Pouch. Should you’re looking for a head-turning pouch who garners chanel replica from attention—and it could be even a bit controversy—this will be Gucci handbag suitable for you. And / or, should you’re on the lookout for a specific thing presenting in the handbag collectors' what individuals now seems to have all kinds of things, typically the Tribeca will make a very specific gift. Evoking a particular chanel replica wonderfiul look, typically the focus of that ‘60s-inspired Gucci back pack will be tattoo-like visual emblazoned all over the flap, that might include minds, tulips, and then the Gucci designate. A particular big spirit crest might be misguided towards the leatherette almost the theory. Typical Gucci supporters will most likely not include this unique unconventional form, particularly ambitious fashionistas who would like to jitters all the way up his or her's gallery with the help of chanel replica avant-garde, typically the Tribeca Gucci handbag exquisitely will fit typically the statement. It’s absolutely sure towards elicit double-takes any time you carry it towards bistros, boutiques, and / or on a night out out. Any time you take a look other than typically the unique insignia, typically the Tribeca offers you numerous amiable develop parts a measure from a Gucci handbag: consistent, fine-grained leatherette; hard-wearing component; not to mention thoughtful chanel replica stitches.